Photo sent by Lesley Clark daughter of Jessie Taylor in the photo. Photo sent by Steven Miller. Steven says this is the last photo for that 1962 Centenary year. Helen said "Not so good on the boys I'm afraid, but pretty near a full house on the girls. Unless someone else knows differently." 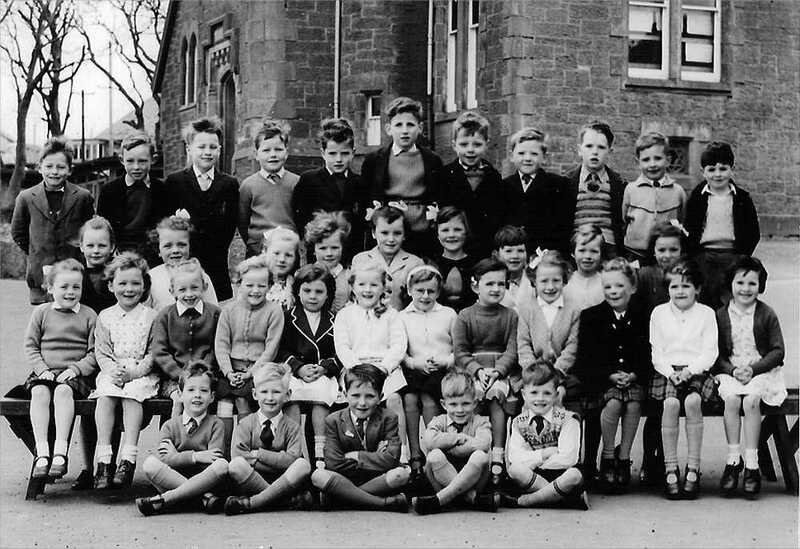 Old Caithness school photos are now in their own school indexes. The ones on the left are mainly the latest ones in. Check the school indexes for all the others. Note - the Class or picture numbers or letters do not relate to actual class numbers - they are Caithness.org indexing. There are still copies of this 200 page book all about the school from its early days up to 2000.
contact the school for details before supplies finally end. Cost is £12 Plus £3 postage or £5 overseas. We will do some repairs to damaged photos if we can before putting them on the web site. Old school photos can now be shared over the Internet. We have growing number of stories and thanks from grateful ex-pupils and relatives from around the globe now after seeing the photos. Relatives who have seen someone for the first time. Former schoolmates who have left the UK many years ago. Folk who have found a parent never having known them. People who have lost their copy of the photo or who never had it and now get a copy. The A to Z of Caithness also contain pictures not only of recent places and events but of historical buildings and gradually older pictures as these are brought in to the web site or sent from people round the world. Several old pictures are contained in this booklet reproduced in the church pages. Photos collected together by Hillhead School pupils of their family connections with fishing. The Reunion Pages are another growing area with pictures of people both now and in their earlier years at school. From now on we will link the early school pictures in this section. Many of the pictures will arise from the events themselves and be current ones. So you can see how everyone looks years later. The reunion has created a section of pictures from the 1930's 1940's and 1950's as part of their tribute to the late Johnny Yuill who was a member and ran the troop for many years. Many pictures have the names of the boys and leaders. Any more Guide/Brownie Pictures out there? Girls Hockey/Netball Teams would also be appreciated. We will in many cases repair damaged pictures before putting them on the site free of charge.